New day breaking, people waiting: second coming of English hard rockers at the time of good riff revival. 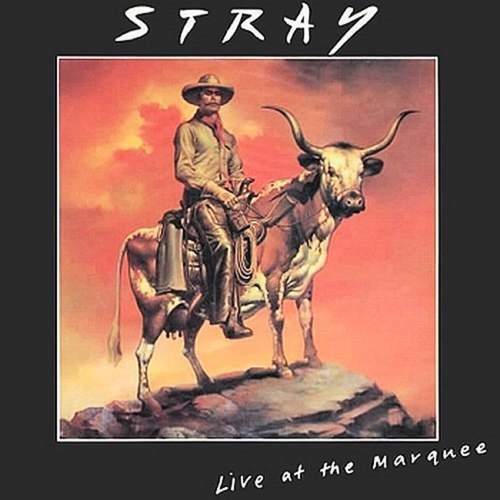 Incessantly serving up strong tunes in the ’70s, STRAY never cared about the gloss because serrated edge suit their music much better – and how else the band’s followers could experience this edge if not in front of the stage? Problem was, the foursome didn’t care about taping a concert either, and remained in bootleg limbo for many years which made “Live At The Marquee” a unique document. It captures the recently reunited “Stand Up And Be Counted” line-up in envious form, asserting their influence on NWOBHM and simply heaving a good time. Boris Vallejo painting on the album’s cover may suggest suppressed danger and raw energy, and this is what’s being spilled on the listener from the opening lines of “Houdini” where Del Bromham’a filigree licks and Pete Dyer’s vocals bounce off the venue’s sweat-drenched environment, while the groovy menace which propels “One Night In Texas” is shaped by the tight lock of Gary Giles’ bass and Ritchie Cole’s drums – a sturdy framework keeping guitar figures from stumbling away. Harking back to the ensemble’s early era, “After The Storm” seems much more streamlined in its almost progressive scope, as Del’s able to unleash his entire armory of various six-string techniques and play around with different tempos, but the infectious funk of “Percy The Pimp” feels so street-smart in public that when the rhythm is being sped up, there’s gutsy animalistic euphoria oozing out of the recording. The audience must have stood in awe of the axe’s rich tone when it was left unaccompanied for a little while before leading the charge. The crowd’s delight is palpable even on the previously unheard “Running Wild” – a solid slice of pub rock which had never seen the inside of a studio, yet lives up to such a generic title with panache. Of course, the pride of place would be given to the group’s moments of glory, “All In Your Mind” condensed to seven molten, rapturous minutes of heavy psychedelia to measure the quartet’s dynamic range, and “Suicide” sounding extremely engaging on the strength of muscular vibrations. Still, it’s “Feel Like I’ve Been Here Before” – a bonus here, obviously the only salvaged track from the rest of quite a long concert – that is the deepest cut on display, one to nail the performance on the head and bring the band home. Expanding this reissue, Bromham’s solo single from 1979 is rather surprising in showing a well-hidden aspect of the artist’s talent, because “Who Do You Love” rolls on a glammed-up groove complemented with harmony guitar, and the happy rock of the B-side “The Best Friend I Ever Had” taps into the ’60s innocence rather than STRAY’s heyday. The band’s second spell didn’t bring any other record, and they broke up again, and it wasn’t before 1997’s "New Dawn" that the veterans returned in earnest, the Marquee tapes remaining a testament to the ensemble’s perseverance.